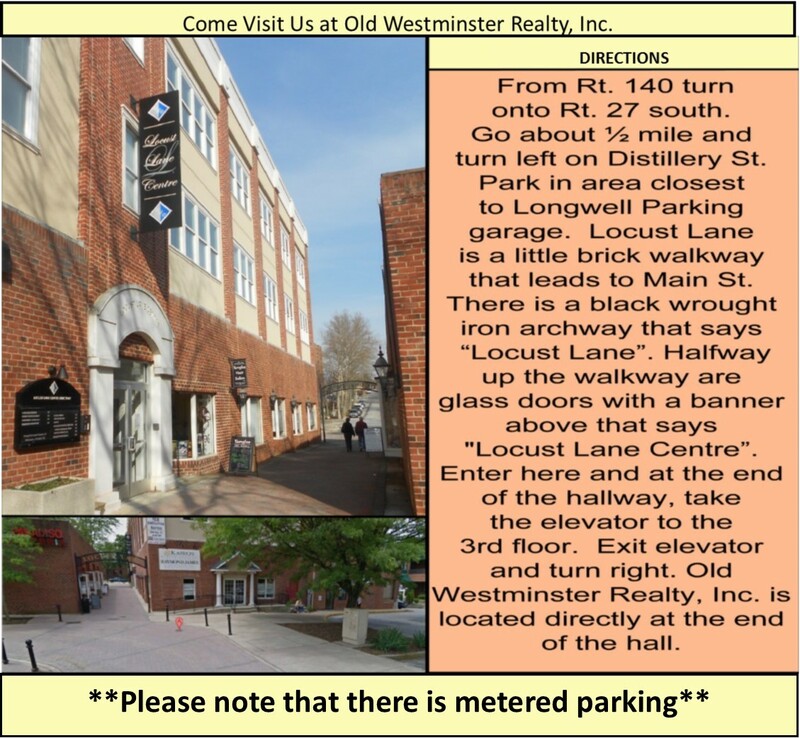 Welcome to Old Westminster Realty, Inc.! Some businesses start with a desire to be a business owner. Others start by inspiration. That’s how Old Westminster Realty, Inc. began…..inspired by a touch in my heart to serve our community with genuine compassion and professional excellence. Thus, the creation of our tagline: "Opening the Door to your Future!" In February of 2007 the opportunity to open my own real estate brokerage in Carroll County was presented to me. After much thought and encouragement from friends, family, and colleagues, Old Westminster Realty, Inc. was born. With 19 years of experience as a real estate agent and also a branch vice president for a large real estate franchise in the area, I was equipped to step out in faith to open the doors to Old Westminster Realty, Inc.
Old Westminster Realty, Inc. began in my sitting room until the condo unit which I was going to call “home” was built out. I enjoyed the location and esthetics, but soon found out that traditional real estate was not the way for me to venture. With much research I felt that a virtual office was the way to go, yet still offering a traditional setting for those agents still comfortable with working in an office. For the next 4 years Old Westminster Realty, Inc. developed into a “cloud” brokerage where serving our community - near and far - was the heart of our mission. Almost a decade later Old Westminster Realty, Inc. reaches the internet savvy prospective buyers, sellers and real estate agents as well as, the traditional seekers of real estate knowledge. Our growth has been growing steadily since the onset and the best is yet to come!